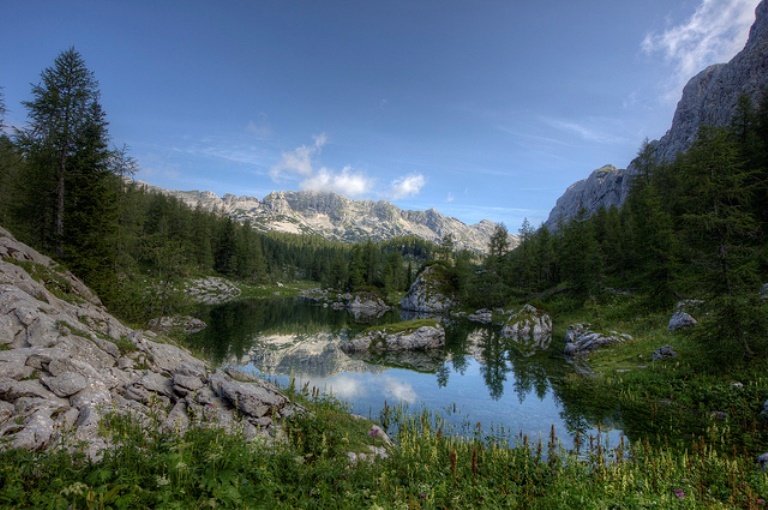 7 lovely and different lakes below magnificent high, unbroken ridges allow for superb views with both day and multi-day walks including an ascent of Veliko Spicje (2398m) which gives spectacular views over the Julian Alps. The Triglav Lakes Valley to the north of Lake Bohinj, is unmissable, a long valley accessed to the right of the great Komarča cliffs; forested in its lower end, it nestles 7 lovely and different lakes below magnificent high, broken ridges. Really superb views and visual thrills throughout. You can do a day walk here, but 2 days, overnighting in the Triglav Lakes hut or the higher (amazingly positioned) Zasavska Koča na Prehodavcih, would allow a full exploration, including an ascent of Veliko Spicje (2,398m) and its high ridge, which commands truly amazing views over a huge expanse of the Julian Alps. The climb involves an exposed, cable-assisted section, which is fine for experienced walkers. You could make it a 3 dayer by adding in a full day in the high range. Or make the lakes valley part of the multi-day walk we call the Grand Bohinj Horseshoe. Beautiful Lake Bohinj to the south, Slovenia's largest, sits in a superb glacially gouged trough, beneath huge cliffs to its north and west end, and is an excellent walking base, with fine walks in every direction. 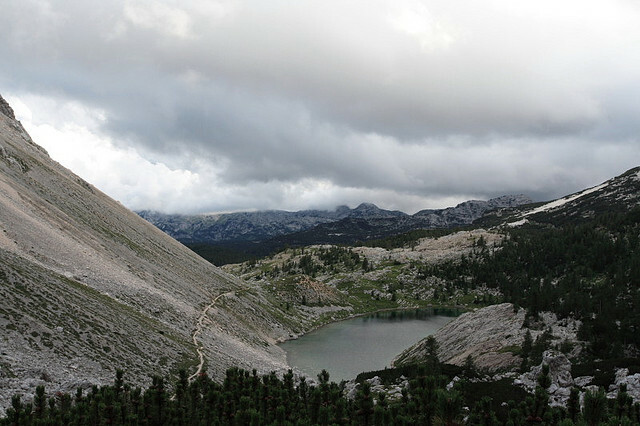 All tastes are catered for, from a tour of the lake and other lower-level saunters (including around the lake and to Slap Savica waterfall), to low peaks to high ridge traverses and summit assaults, including the easiest ascent of great Triglav.